Marking the introduction of the Smith brand as the new manufacturing arm of its business, leading trade-only supplier William Smith has invested significantly in new production machinery. In addition to a powder-coating unit, this has included installation of a large-format AXYZ 4020 CNC router supplied by AXYZ. It complements the existing AXYZ 4010 machine but now offers an enhanced production capability. Both routers are a feature of the recently enlarged Smith fabrication facility. Production Manager at Smith, Martin Rodgers commented: “Installation of the AXYZ 4020 router has led to a 30-40 per cent increase in output and a commensurate reduction in turnaround times. 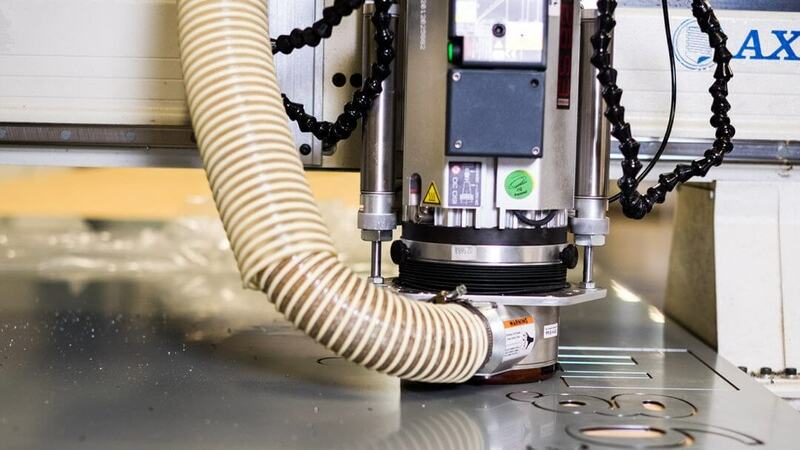 It has also enabled access to an increased volume of large contract work involving primarily the manufacture of sign trays for major corporate ID projects.” The router is used to process a wide range of sign-making materials, including aluminium sheet, aluminum composite material (ACM), acrylic, PVC, wood, MDF and foamed board. The AXYZ 4020 is part of the family of 4000 series routers supplied by AXYZ. It offers a processing width of 1524mm and a processing length of 1220mm that can be extended to over 10m by increments of 610mm. The router incorporates a seven-station automatic tool change (ATC) facility and the latest helical rack and pinion drive system. This represents a significant upgrade to the existing AXYZ 4010 machine that did not include this particular production tool enhancement. The system features a multiple gear teeth configuration that helps spread the work load more evenly, leading to faster throughput rates, less material wastage, quieter operation and ultimately a longer than normal machine life. As with all AXYZ routers, the 4000 series can be supplied with a number of optional production tool enhancements. These include the latest A2MC machine control system, the AXYZ Vision System (AVS) and the AXYZ Auto Zone Management facility that ensures the material being processed is always held securely during the routing/cutting cycle. For further information on AXYZ routers, check out our product comparison.